And out of the ground the Lord God formed every beast of the field, and every fowl of the air; and he brought them unto Adam to see what he would call them: and whatsoever Adam called every living creature, that was the name thereof. THE centrality of the Word (or as many scholars prefer, the Greek term Logos) to Christian thought is established early on in the Bible. The first action God asks of man is the naming of the beasts. Most biblical exegesis argues this is more than just a sign of man’s dominance over creation: it is a part of that very dominance, for the ability to name something goes hand in hand with the ability to conquer it. Fittingly, for the leaders of such an extrovertly ‘Christian’ nation, American politicians understand this extremely well – and at no time is it more evident than during a presidential election. Aspirants to the highest office not only have to name and define their enemies, but avoid being named and defined themselves. Being Adam is fine, but the worst fate is to be “the word made flesh”: to have your name become synonymous with some awful abstract evil, so that you seem the walking embodiment of it. That, of course, is the fate Hillary Clinton suffered in the 1990s, and a legacy she is still trying to shake off. As late as September last year Jerry Fallwell, one of the leading right-wing televangelists, joked that a run by Hillary would energize his base even more than if the Democrats picked Lucifer. 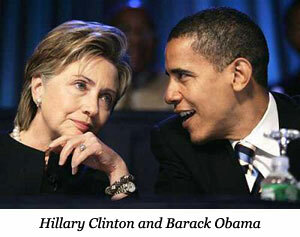 Hillary’s main Democratic rival, Barack Obama, must guard against a similar fate. As he himself has noted, the fact that his surname is one letter off “Osama” has been an “irresistible target of mocking websites”. Nor does it help that his middle name is ‘Hussein’, or that Fox News recently claimed that a school he attended when growing up in Indonesia was a fundamentalist madrassa. Subsequent reporting exposed this as a lie, and Obama’s admirable reaction to much of the hubbub has been to laugh it off; but if there was ever a candidate to enter the Naming of the Beasts at an immediate disadvantage, it is he. On the Republican side, the man most damaged by the naming process so far is Senator John McCain. All but unstoppable a year ago, McCain’s star has begun to wane, a slide almost entirely attributable to his support for a ‘troop surge’ in Iraq. (When President Bush announced plans to send further troops to Iraq, he entered a semantic war with the media over whether this would be called a ‘plus-up’ or ‘troop surge’. ‘Troop surge’ – with its Vietnam era resonances – appears to have won for the moment, but both now routinely go without their original inverted commas). The dark horse Democratic candidate John Edwards waggishly dubbed this unpopular tactic “the McCain option”, and opened the wound that little bit further. The great white hope of the Republican right is former Massachusetts Governor Mitt Romney. But two major factors threaten his bid. The first is that he’s a Mormon, one of a faith considered outlandish even by those evangelicals who believe that Satan put dinosaur bones in the earth to confuse mankind. Second: in order to succeed as a Republican in ultra-liberal Massachusetts, he has had to adopt all sorts of ‘left-wing’ social positions which he is now busily refuting. As he reverses these stances, he leaves himself open to being that dreaded label ‘flip-flopper’. Supporters fear he may become a kind of Republican John Kerry. This is a lesson for the candidate currently playing the smartest game: New York’s former mayor Rudy Guiliani. He has kept a low profile so far, and has even been coy about confirming that he’s running at all. Some pundits fear this will hurt his money-raising efforts, but Guiliani stands to gain more by laying low. His widespread name recognition is largely to do with his heroics on 9/11; less well-known are his comparatively liberal social views on everything from gun control to gay marriage. If Guiliani can keep his head down until his enemies have self-destructed, he can present himself as the Republicans’ saviour: they may well be willing to choose a no-nonsense tough guy with some positions liberal enough to win over independents and wavering Democrats. It might be worth bearing in mind, though, the second act of God for Adam: creating a “help meet for him”. Like Adam, the winning candidate will need to find a mate; a running partner to balance the ticket. The main pool of candidates will be the very people whom the winner has spent the last year briefing against. Paradise is a very fragile place. TF Lane is a US-based journalist and Contributing Editor of The Liberal.